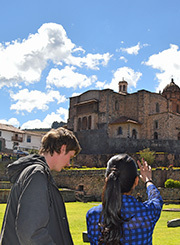 Our Spanish school in Cusco offers complementary weekly activities in and around the school about 2-3 times per week. Activities are usually free, but you may have pay out-of-pocket expenses like transportation and entrance fees. If you would like to take a weekend trip around Perú and the region, we can help you plan a personalized individual or group trip. Prices for weekend trips vary depending on the destination.